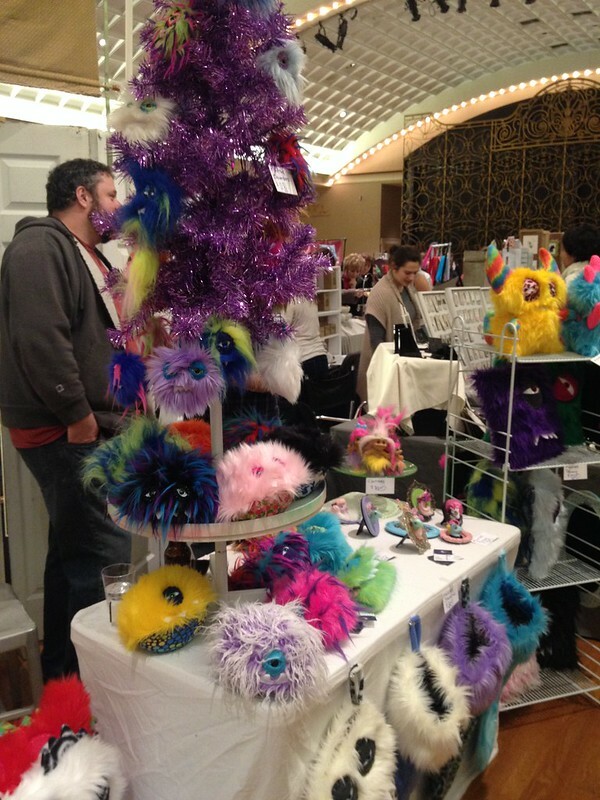 Local holiday shopping kicked off on Saturday with the Crafty Supermarket Holiday Show hosted inside Music Hall. 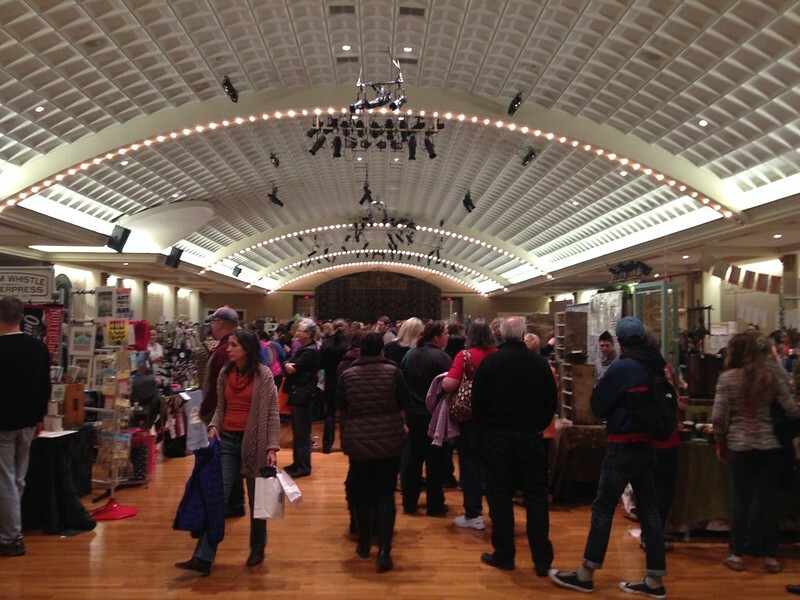 With over 90 vendors and hundreds of new items, shoppers were sure to find something for everyone on their list. Of course, considering that this year was also Crafty Supermarket's largest-ever turnout at 4,000+, attendees may have missed an item or two. Worry not! 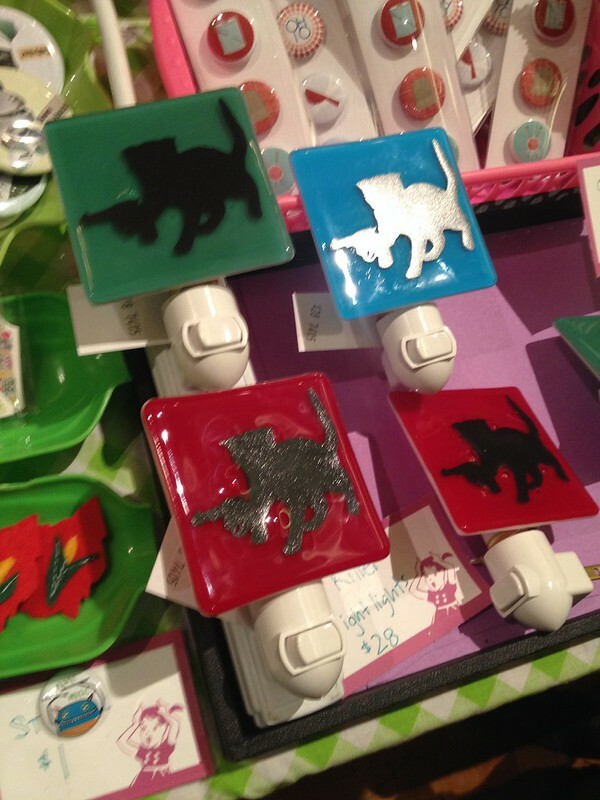 CincyWhimsy perused every aisle and created a collection of 15 favorite finds, many of which are available online from the retailer. 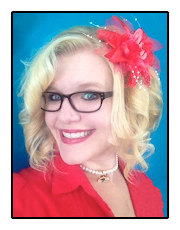 Formerly a chemist for Bath & Body Works, Hannah Follis has developed a line of fragrances, eye shadows, and lipsticks that are cruelty-free and look and smell amazing. 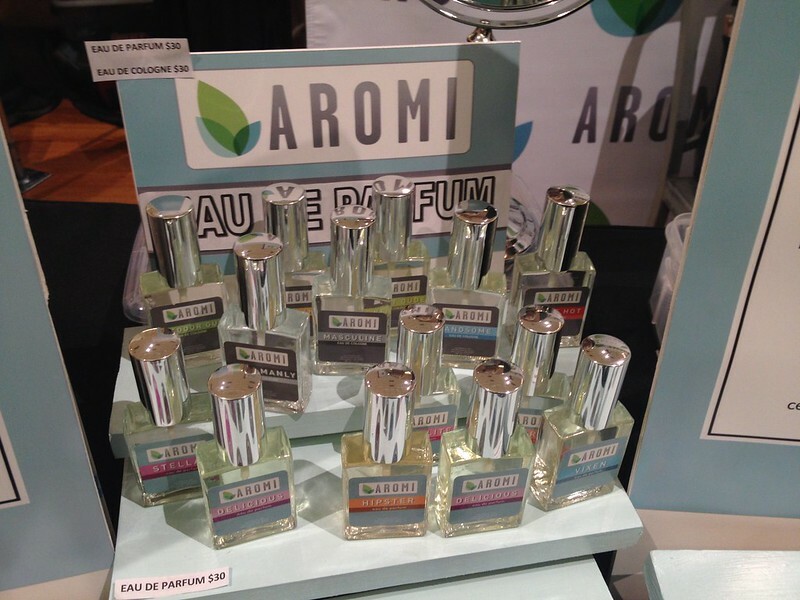 Unlike standard vegan-friendly cosmetics, which tend to be crude or have limited appeal beyond the environmentalist crowd, Aromi is a beauty line that everyone can love. 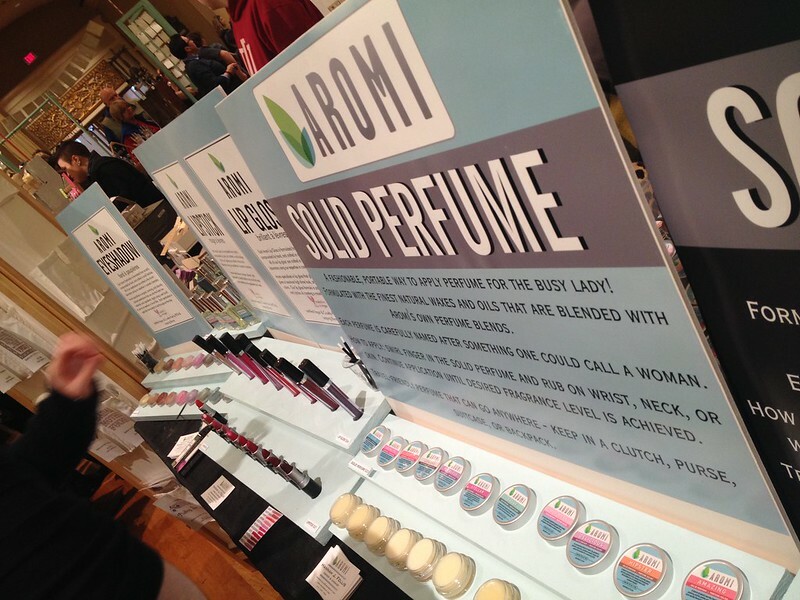 With a dozen luscious scents, 15 bold shades of lipstick, and even a line of colognes for men, Aromi provides a polished look with the quality of a national store, but with your dollar instead going straight to an entrepreneur. 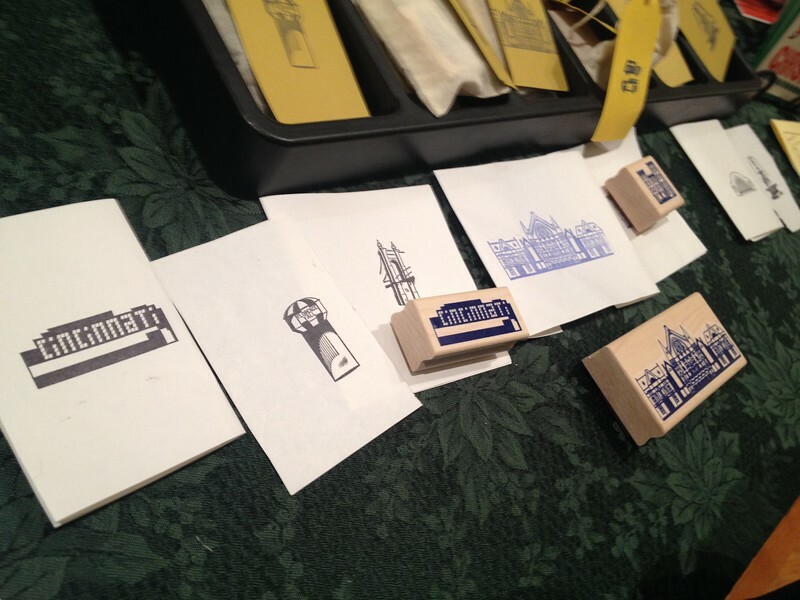 Not one, but two unique gifts caught my attention at Steam Whistle Letterpress: a customizable leather notebook and a rubber stamp set featuring Cincinnati landmarks, like Music Hall, Union Terminal or historic row houses. Located in Over-The-Rhine, owner Brian Stuparyk prints everything using old-fashioned letterpress machines, giving everything from greeting cards to book covers a crisp, historic finish. 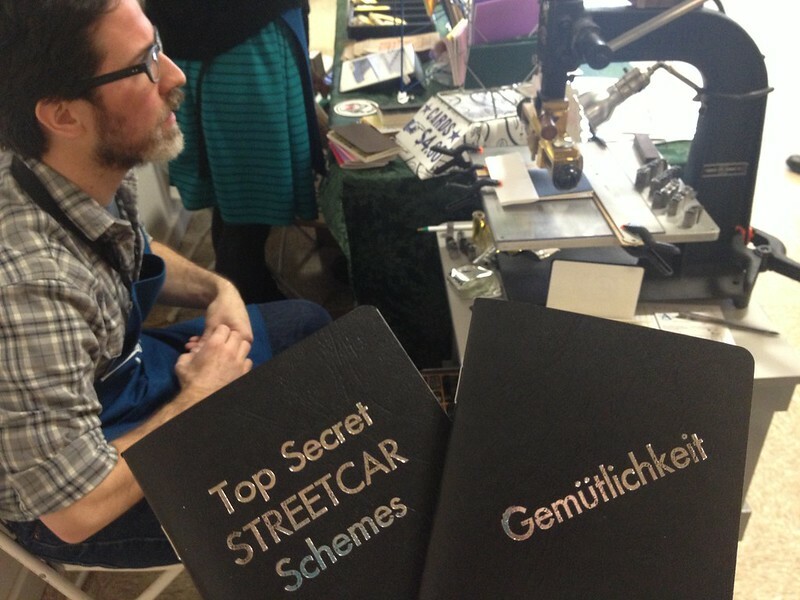 For the event, Brian used a foil press to create lettering on the leather notebooks. 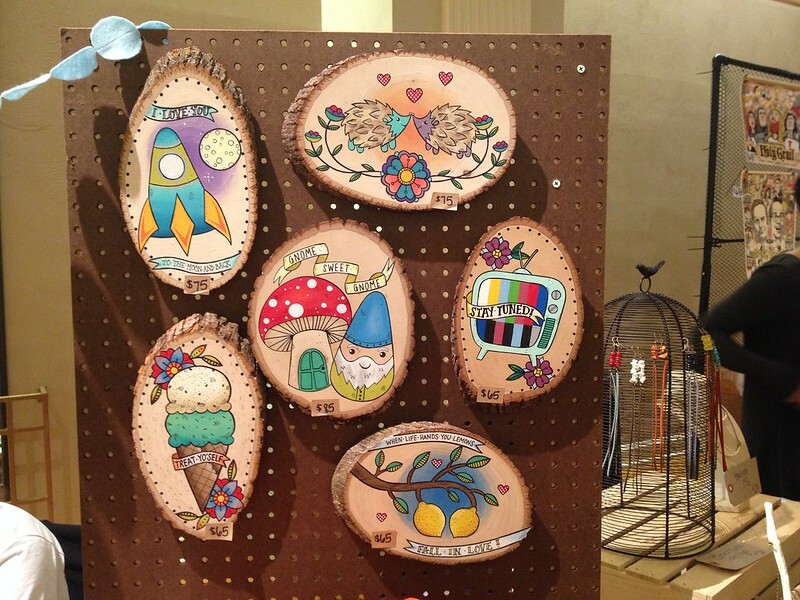 Capturing nostalgia and the imagination, artist Jesiiii uses wood (sometimes with bark attached) as her canvas. 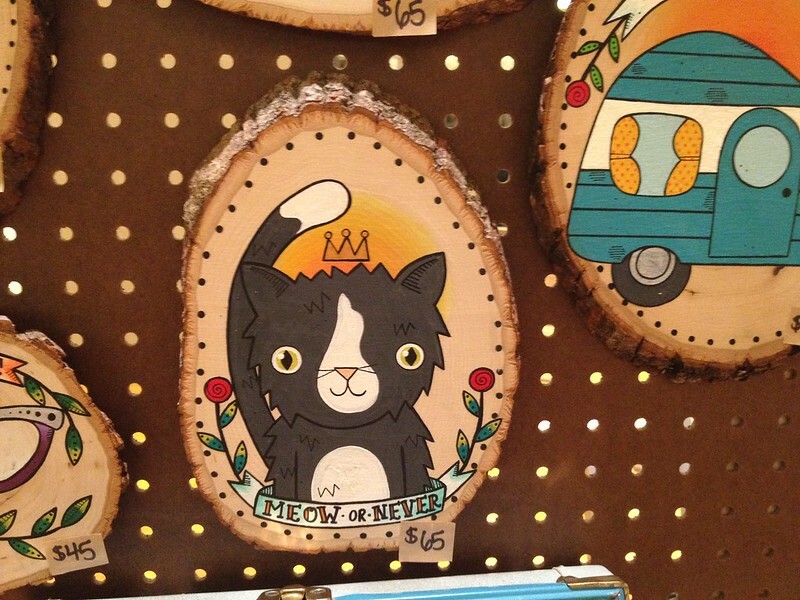 Bright colors and darling characters compliment the punny phrases scribed around them, such as "To gnome you is to love you," or "It's meow or never." 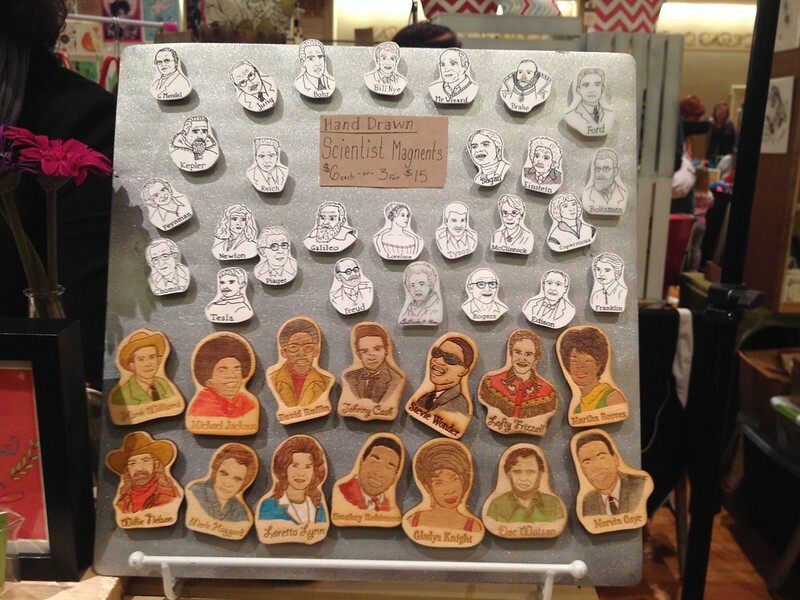 Cheer up any room with one of her portraits, or make friends with a Pocket Pal: a quarter-sized, egg-shaped wooden charater that slips right into your pocket. Kate Funk loves to dress up her cat, in a way that takes "crazy cat lady" to a new level. 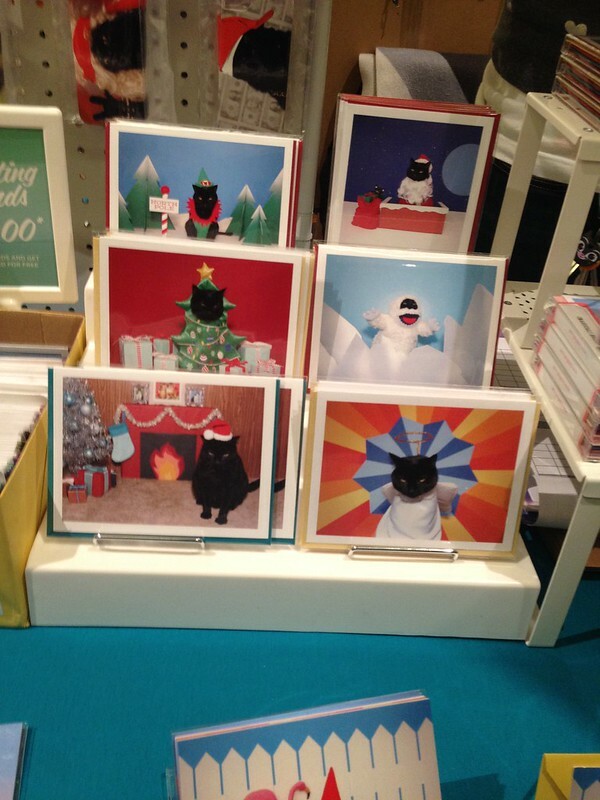 From iPhone covers to throw pillows and holiday cards, her feline muse, AC, shows off his personality on every form of medium that Kate can think of. Forget the birds; let's put a cat on it. 5.) BURNING RIVER CANDLE CO. It's the candle shop that will catch even a man's attention. 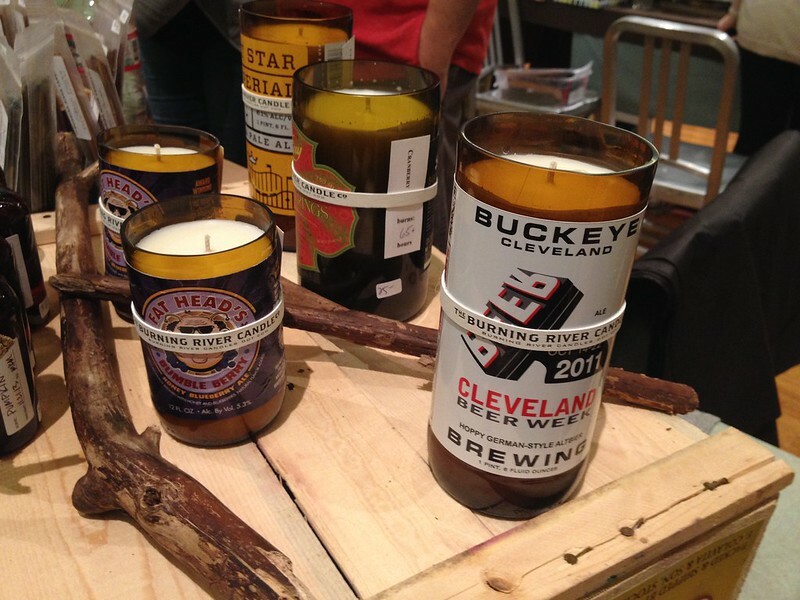 Outfitted in you favorite craft beer bottle, Burning River Candle Company features uniquely scented soy candles use natural wax and their own hand-cut and polished recycled glass bottles. Scientists and Motown; two topics rarely to be crafted, and even more rare to find as a combination in one shop. 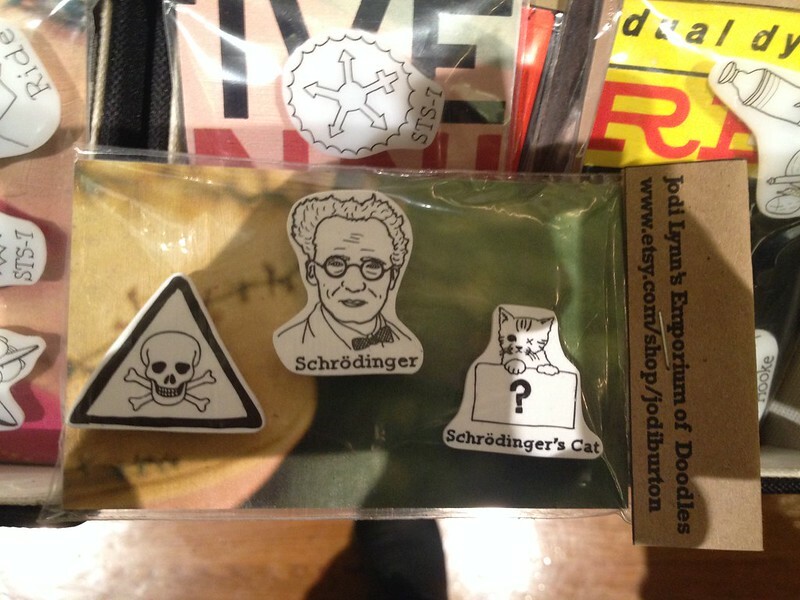 Jodi Lynn's Emporium of Doodles has all your nerdy obscurities covered, including hand-etched magnets and keyrings of anything from Smokey Robinson to Schrodinger's Cat. Pop art sensation Darin Shock not only draws; he also creates hand-carvings of his illustrations. 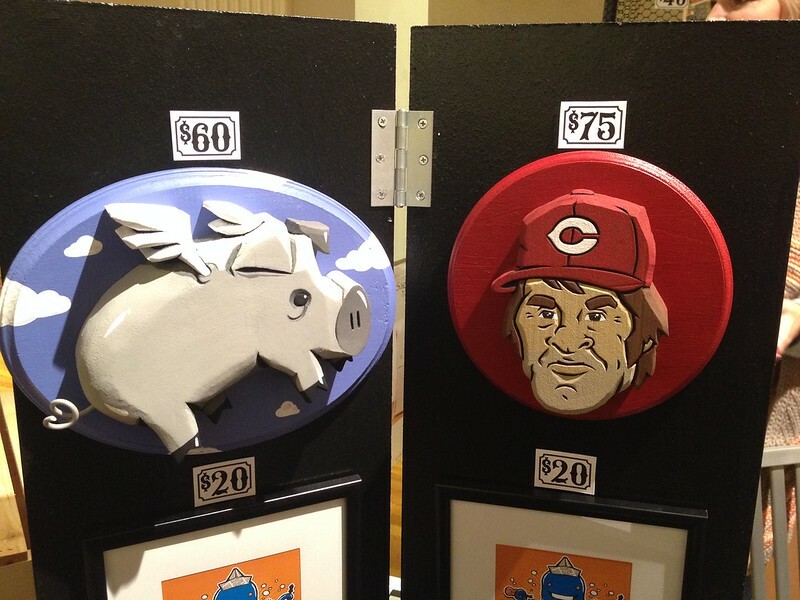 This weekend he showed off his Cincinnati Flying Pig and Pete Rose figures. With many other sports stars and music icons in his collection, State of Shock is the place to snag that special gift for the collector who thinks he has everything. 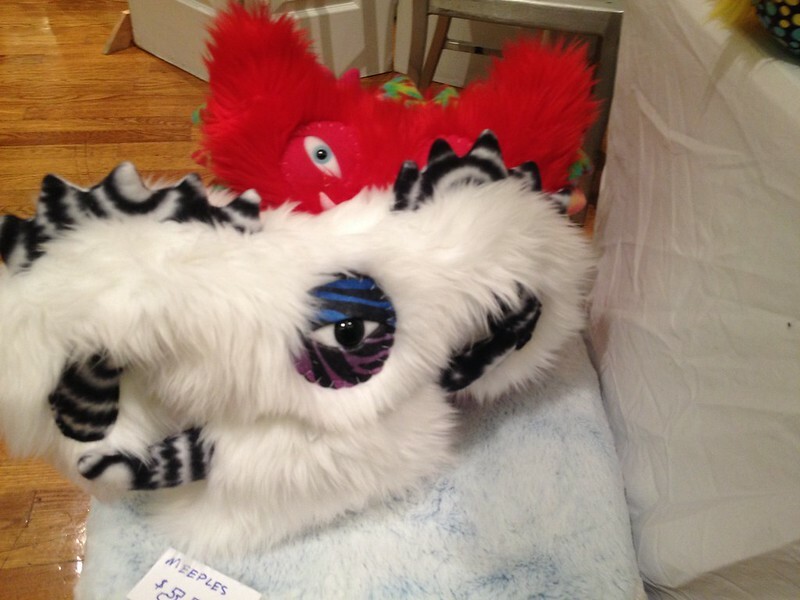 Pillows, plush toys, and even wallets, the Bearmojo factory is cranking out the cutest monsters in the world. 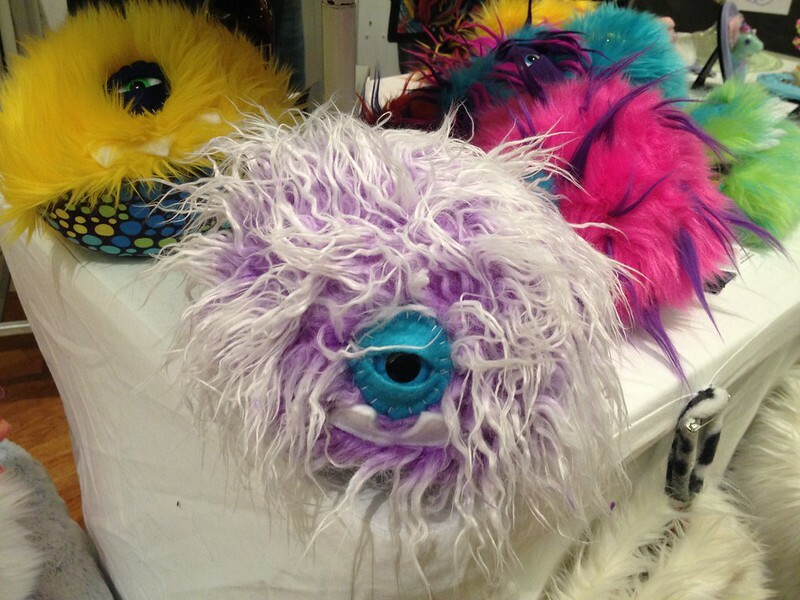 Bright and furry, these creatures immediately caught my eye from across the room. Crafted for the "UnGrownup" yet perfectly suitable for children, any present from Bearmojo is guaranteed to steal the show this holiday season. 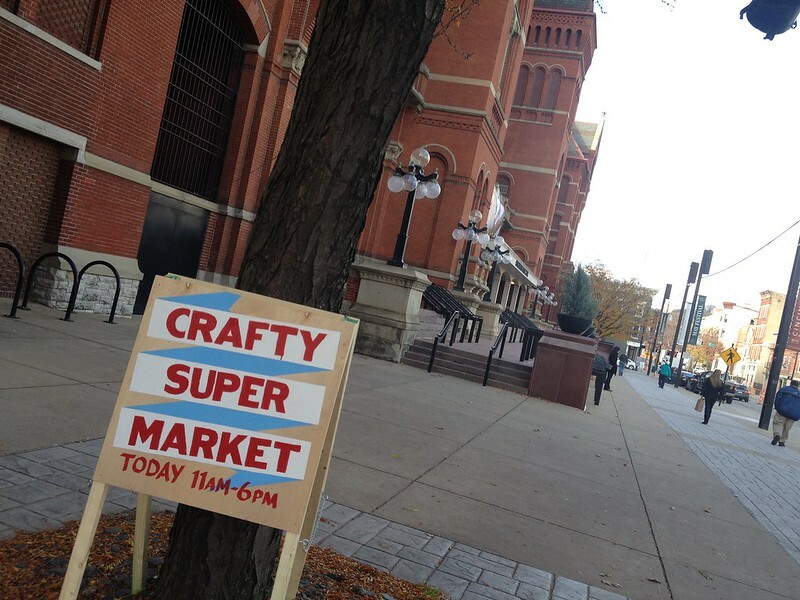 A real-life Etsy storefront in Columbus, Wholly Craft! 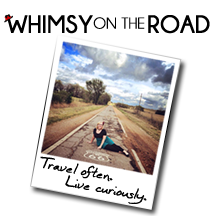 is a retail shop for all Cbus creatives who need a place to sell their wares. Some of the selection was brought to Crafty Supermarket, including this little gem, a "Killer Nightlight" which features a kitten holding a gun. That will keep the monsters away! 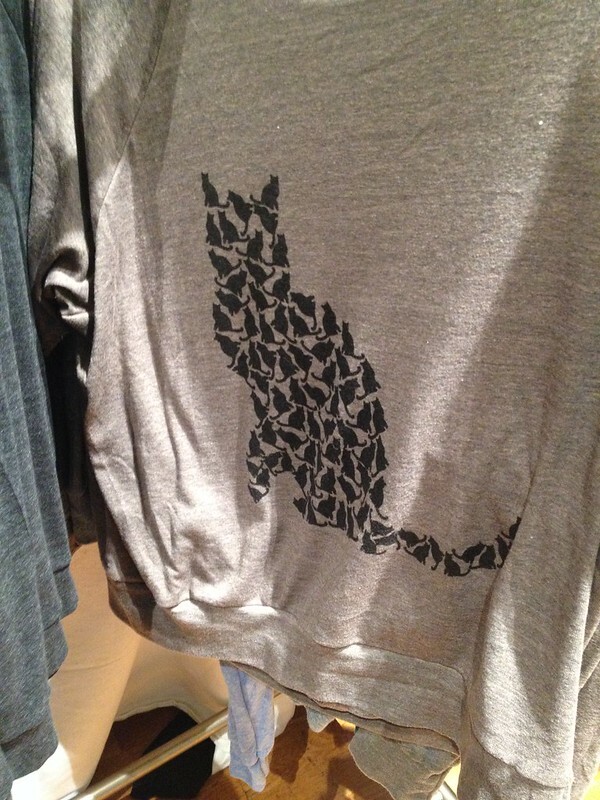 Speaking of cats, we fell in love with vendor Alison Rose for a second year in a row after spotting this shirt: a cat created out of many miniature cats! You may remember CincyWhimsy swooning over her fortune holder wallets during the previous holiday season, and yes, she still has those available too. 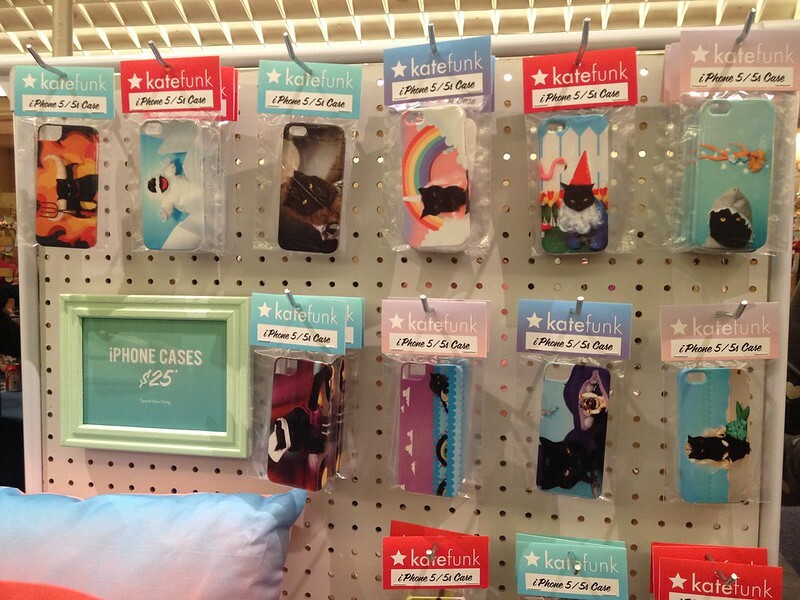 But wait...there's even more cat stuff! Located in Northside, Fabricate is Cincinnati's version of a retail Etsy store, selling the wares of many crafters in a brick-and-mortar shop. 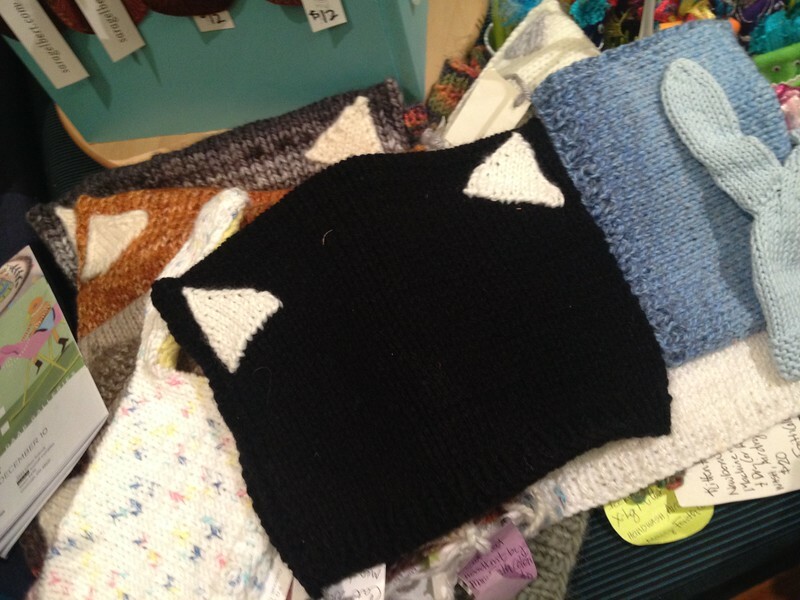 One of their many selections includes these knitted caps with kitten ears. There are many different breeds of hats, such as black cat, Siamese, orange tabby, or grey tabby. Super soft and warm, these hats are the next best thing to having a cat on your lap to stay cozy. 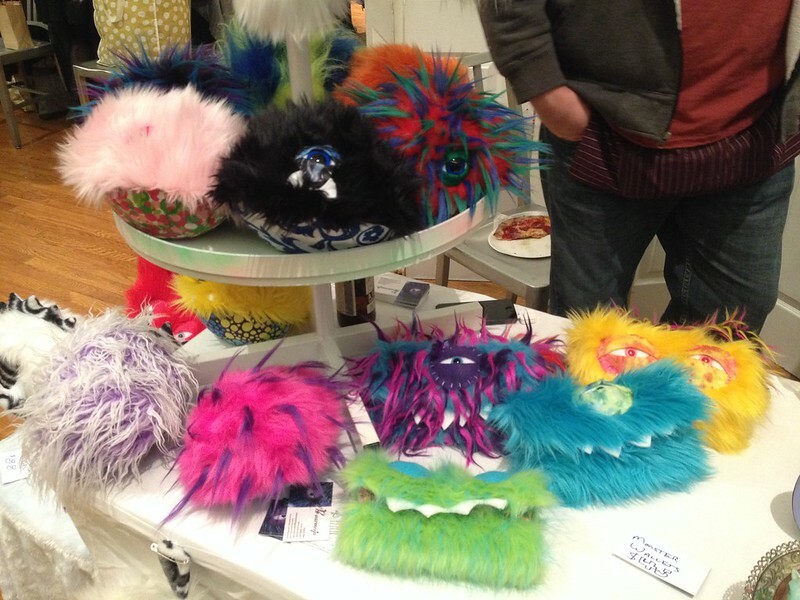 Looking for a retail Etsy store on the West Side? Broadhope Art Collective has you covered! Located across the street from Westwood Town Hall, Broadhope features dozens of local artists and crafters merchandise with convenient parking and shopping hours. 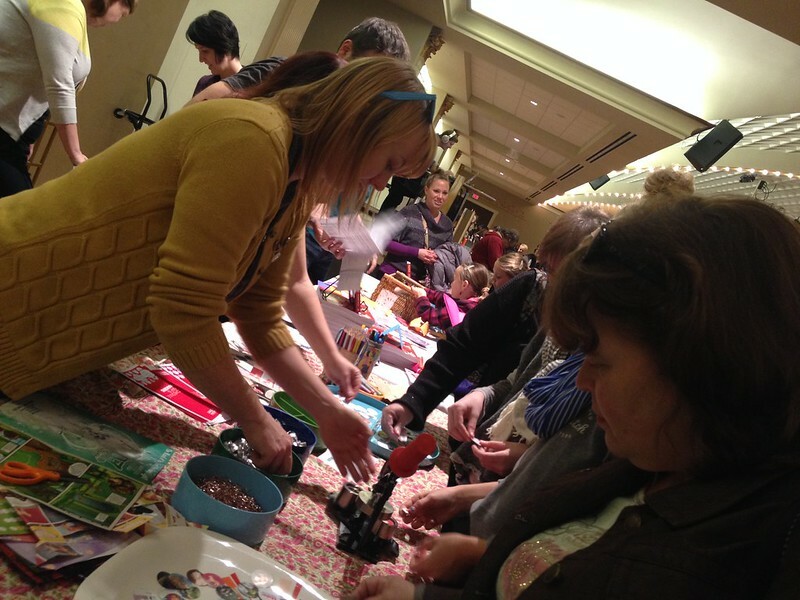 They also host crafting classes, like the make-your-own-button demonstration at Crafty Supermarket. 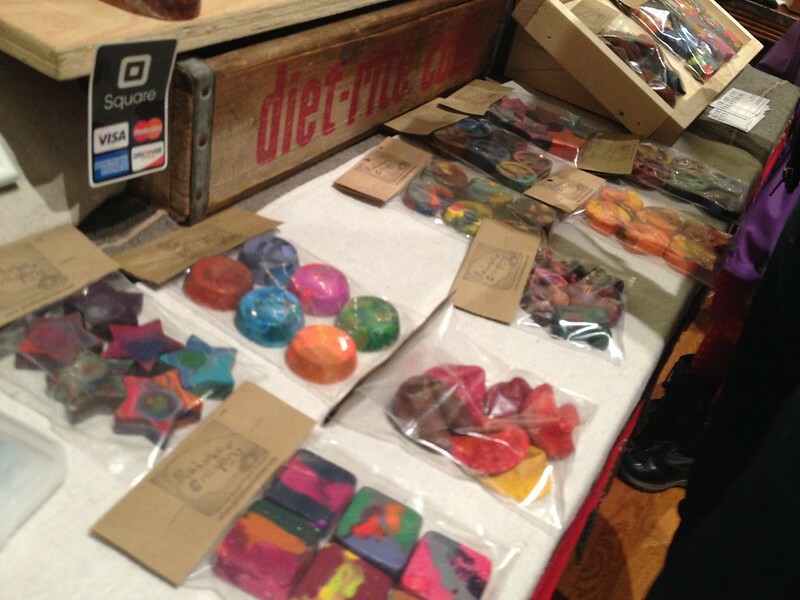 Long before Pinterest, Nicole Lewis was recycling her own crayons. Melting down old nubs of Crayolas to make a new, big rainbow crayon became her passion. Her business, Art 2 The Extreme is the original creator of the recycled crayon, and offers over 100 shapes and sizes of her colorful creations, including icons ranging from fortune cookies to Lego bricks. 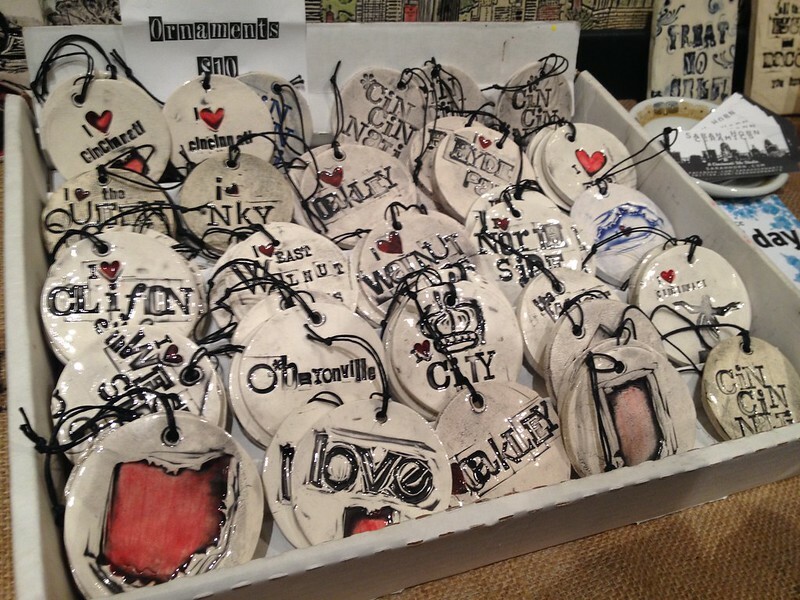 Making another exciting return to the blog are the Cincinnati neighborhood ornaments by Sarah Horn Ceramics. 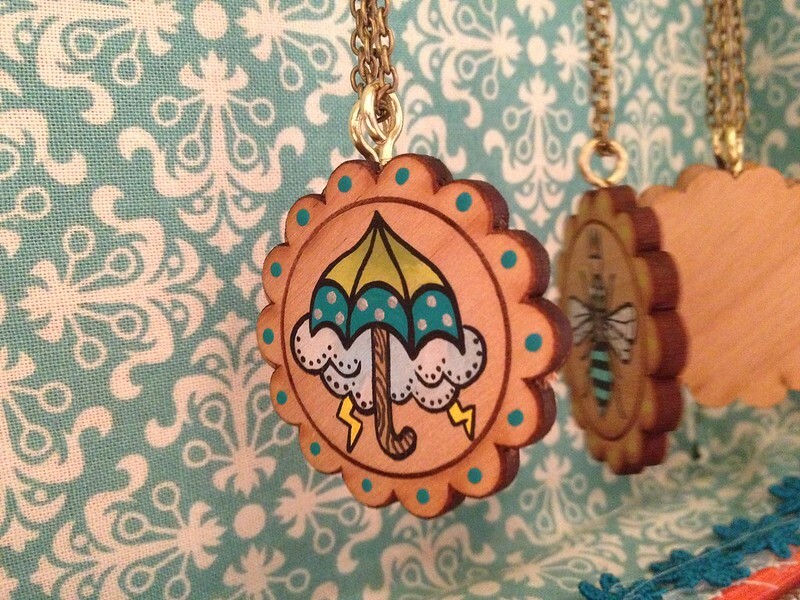 These charming dangles of hometown pride topped CincyWhimsy's list last year as our favorite holiday present. Now they're back and in more variety than ever, featuring all 52 neighborhoods plus your favorite places in Northern Kentucky and Indiana. Taking a different approach to the word "craft," the Music Hall Ballroom Bar was serving up cocktails all day during Crafty Supermarket. 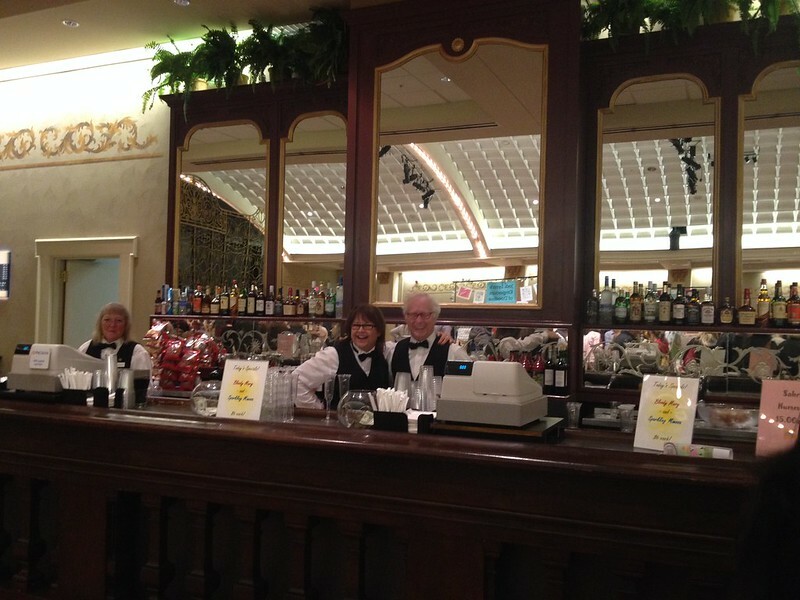 From mimosas to martinis, the jovial bartenders kept everyone in good spirits throughout the afternoon. One of the most practical and much-welcomed gifts of the season is that of a new wallet. Let's face it; they wear out every year or so and as the owner, we get so attached to our comfortable, familar wallet that it's challenging to find a replacement that matches up. When gifted from a friend, however, the new wallet comes with sentiment; a fond memory of a loved one every time you reach for your credit card. 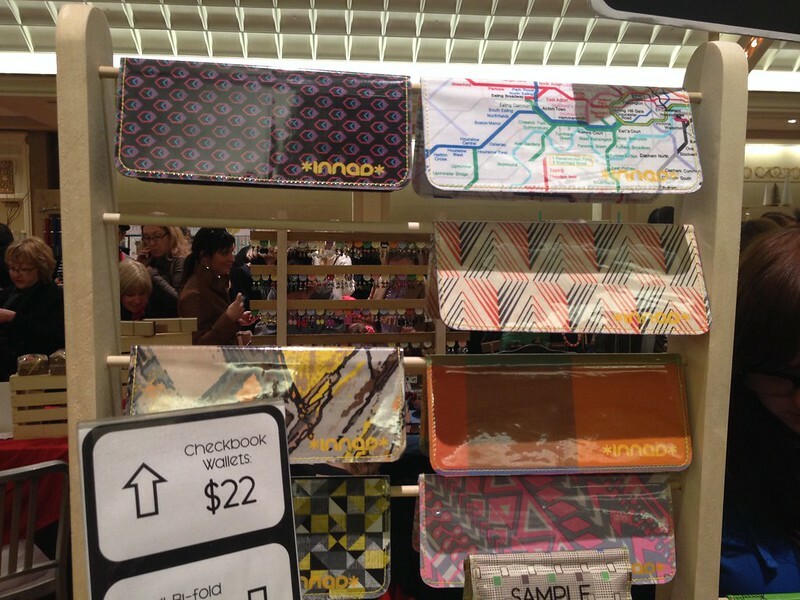 To help with your transition, Innad designed a series of sleek, durable wallets and check book covers, such as the always-handy transit map.